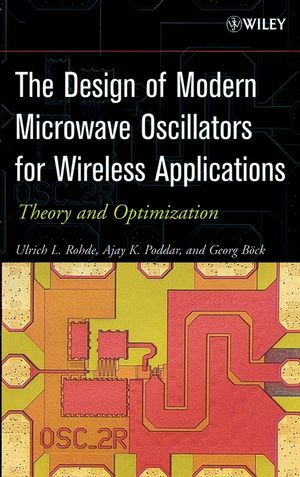 While most of the current literature in the field concentrates on classic design strategies based on measurements, simulation, and optimization of output power and phase noise, this text offers a unique approach that focuses on the complete understanding of the design process. The material demonstrates important design rules starting with the selection of best oscillator topology, choice of transistors, and complete phase noise analysis that leads to optimum performance of all relevant oscillator features. Also included are CMOS oscillators, which recently have become important in cellular applications. For readers interested in specialized applications and topics, a full chapter provides all the necessary references. This text is partially based on research sponsored by the Defense Advanced Research Projects Agency (DARPA) and the United States Army and conducted by Synergy Microwave Corporation. With the wealth of information provided for the analysis and practical design of single and synchronized low-noise microwave oscillators, it is recommended reading for all RF microwave engineers. In addition, the text's comprehensive, step-by-step approach makes it an excellent graduate-level textbook. ULRICH L. ROHDE, PhD, Dr-Ing, IEEE Fellow, is Chairman of Synergy Microwave Corporation; a partner of Rohde & Schwarz, a Munich, Germany firm specializing in test equipment and advanced communications systems; and Professor of Microwave and RF Technology at the Brandenburgische Technische Universität Cottbus, Germany. He was previously president of Compact Software, Inc. and a member of the Board of Directors of Ansoft Corporation. Dr. Rohde has published more than sixty scientific articles, and has authored or coauthored six books in the field of microwaves and communications. AJAY K. PODDAR, Dr-Ing, IEEE member, is a Senior Design Engineer for Synergy Microwave Corporation, Paterson, New Jersey, and was previously a senior scientist for the Defense Research and Development Organization (DRDO) (1991–2001), Armament Research and Development Establishment, Pune, India. He has published more than twenty scientific papers. His main interests are communications systems and circuits, specifically RF-MEMS and microwave and millimeterwave oscillators. GEORG BÖCK, Dr-Ing, IEEE Senior Member, is Professor of Microwave Engineering at the Technische Universität Berlin, Germany, and head of the Microwave Department. His main areas of research are the characterization, modeling, and design of microwave passive and semiconductor devices; MICs; and MMICs up to the millimeterwave range. Dr. Böck has published more than 100 scientific papers. 2. General Comments on Oscillators. 6. General Theory of Oscillators. 8. Calculation and Optimization of Phase Noise in Oscillators. 10. Systems of Coupled Oscillators. 11. Validation Circuits for Wideband Coupled Resonator VCOs. Appendix A: Design of an Oscillator Using Large Signal S-Paramenters. Appendix B: Design Example for Large Signal Design Based on Bessel Functions. Appendix C: Design Example for Best Phase Noise and Good Output Power. Appendix D: A Complete Analytical Approach For Designing Efficient Microwave EFT and Bipolar Oscillators. Appendix E: CAD Solution for Calculating Phase Noise in Oscillators. Appendix F: General Noise Presentation. Appendix G: Calculation of Noise Properties of Bipolar Transistors and EFTs. Appendix H: Noise Analysis of the N-Coupled Oscillator Coupled Through Different Coupling Topologies.